One year on from the band's sixteenth studio, and German ebm pioneers Project Pitchfork unleash album number seventeen, 'Blood'. The album continues to see the band play with aggrotech and futurepop influences within the framework of their classic ebm sound. Hard beats, catchy melodies and sing-a-long vocals are at the fore of the album, showing that the trio are not in any danger of slowing down any time soon. Kicking off with the imposing slab of dark dance-fodder that is 'Blood-Line (Never)', the band set the pace early on. Songs such as 'Blood-Stained (Give Me Your Body)', 'Blood-Pressure (Just For My Pleasure)', 'Blood-Game (For You)', and 'Blood-Thirst' follow-on in a similar vein, blending the hard dance beats with some sublime synth work to get the audience hooked. While songs such as 'Blood-Moon (Romance)', 'Blood-Shed (Dark River)', 'Blood-Lust (Mental Island)' and 'Blood Night' delve a little deeper exploring dark electro territory and throwing in some glitchy moments for good measure. At thirteen tracks, 'Blood' is a good length album, and the band definitely vary things up to hold the listener's interest. Though the three remixes included of 'Blood-Stained', 'Blood-Lust', and 'Blood-Line' feel somewhat superfluous to proceedings as they are at best more club-orientated edits of what are pretty strong dance tracks already. 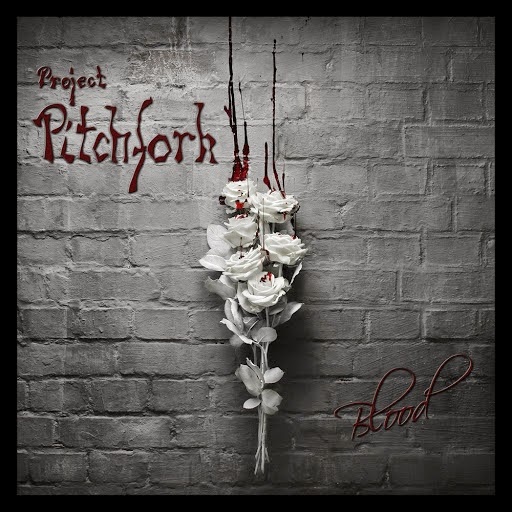 As you'd come to expect from a veteran act such as Project Pitchfork, the production on this album is excellent. The beats are big and hard, the vocals cut through the mix with great effect and the synths have that big, room-filling quality that makes you want to see them live. After twenty-odd years in the game, Project Pitchfork are still a band with a lot to offer, and are indeed still at the top of their game. They know their audience well and still continue to push themselves to keep the hits coming. 'Blood' definitely stands up with the classics in their discography.